Earlier today I gave you a little taste of my childhood Christmas tree traditions. Though fond memories, the events from my youth shaped my present day desire for convenience and simplicity when it comes to the annual selection of a tree. Thankfully, Wendy's desires tend to align with mine. Since Wendy and I now live on our own, we are free to develop our own traditions. We have no children to scar with idealized seasonal misadventures, thus we opt to follow a slightly more simplistic and less emotionally distressing route to obtaining and decorating our tree. This year, and for the last seven years, we've jumped in our twelve year old Mustang (still waiting on our new car to arrive any day now) and headed down to our local Lowes to pick out our tree. 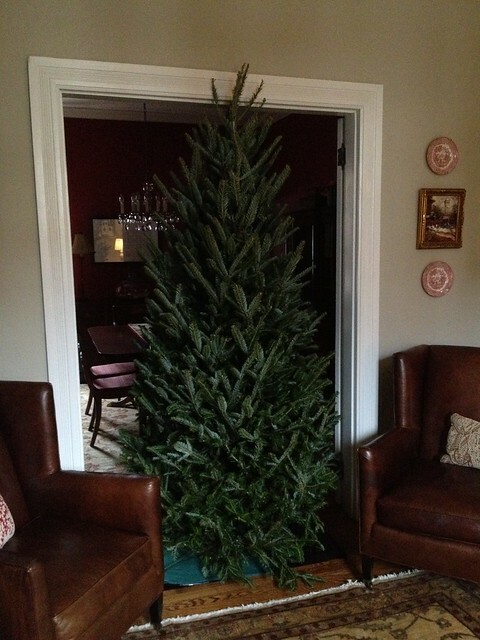 I know some people may have a serious issue with us buying our tree at a big box store, we had issues with it the first year we did it too, it just felt unnatural being raised on the Griswold style tree hunt! 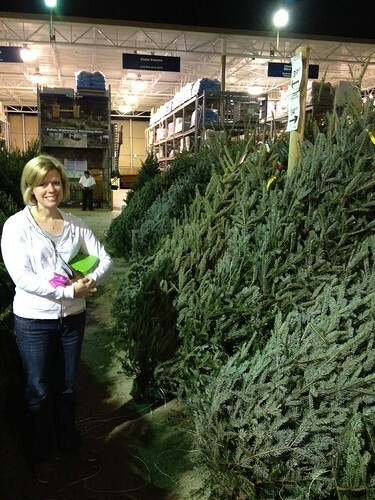 But what we've found is that every year we've done it, we get a good tree at a very good price (about $38) and it lasts at least through New Years Day. Sure, the selection process is more difficult than surveying a field of live and uncompressed trees since you don't know exactly what it will look like when the branches fall, so we always try to get a very full tree that we can trim and thin out if necessary. We always gravitate towards Fraiser Fir trees since their needles are firm but not too pointy and they tend to have that classic look. 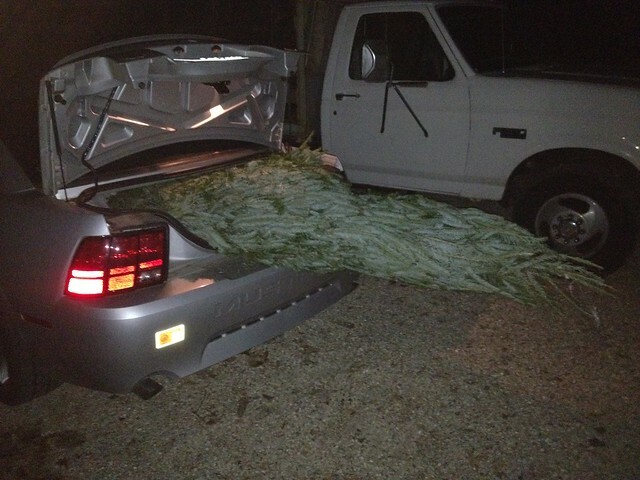 With our tree selected, we actually shove it in the trunk of our car and make the slow trip back to our home. It's surprising what you can fit in a Mustang, no? I do think it will be far easier next year with our new car. 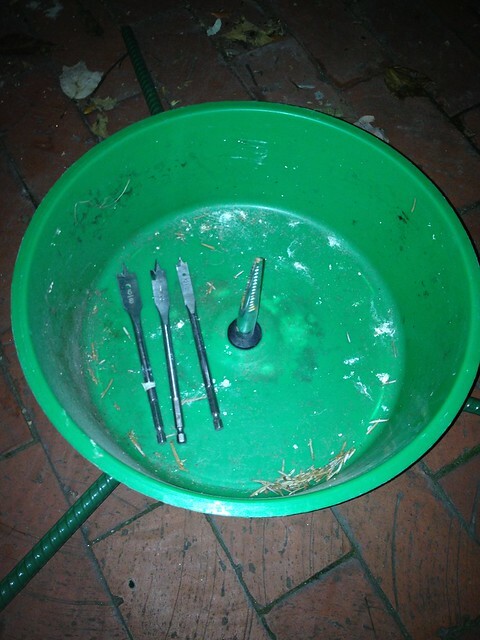 When we arrive home I get to work trimming the trunk and drilling the hole for the tree stand. The stand we use is the simple rebar base with plastic watering tray and center spike. Knock on wood, but we've never had an issue with a tipping tree. Once mounted we keep our fingers crossed that it is fairly straight and plumb, and transport it into the house to be unwrapped, sort of a grand unveiling. We like to place our tree in the door opening between our dining room and living room, which means the tree needs to be only about seven feet tall, rather than the nine to ten foot tree that would be necessary to reach the ceiling. This also means we don't need to do a whole bunch of furniture moving to fit the tree in amongst the rest of our stuff. 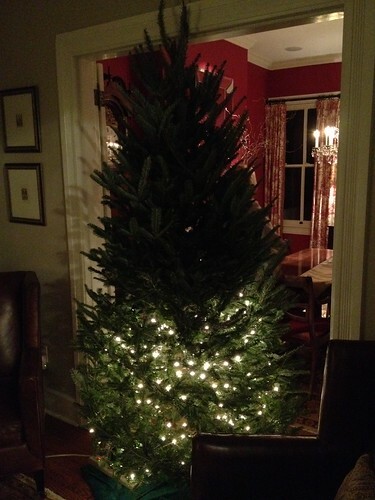 Besides, our house is too narrow to accommodate the wide base of a nine foot tall natural tree. I don't think they make them that way. 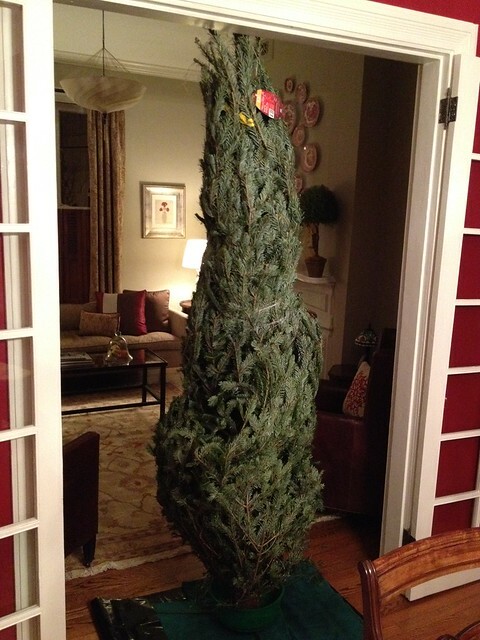 We typically unwrap the tree, supply it with 4 parts water and 1 part 7-Up, and leave it for a night to allow the limbs to fall into position. The next night, Wendy and I like to turn on a good Pandora Christmas station on our whole house audio system, perhaps make some tea, and commence the tree trimming, lighting, and decorating. 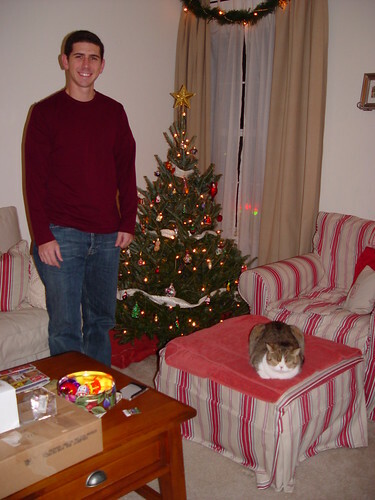 We have a tradition in our home that started with our first small apartment trees and has continued ever since. We've taken the somewhat ridiculous, perhaps pretentious, but very dedicated approach that we only decorate with glass ornaments. 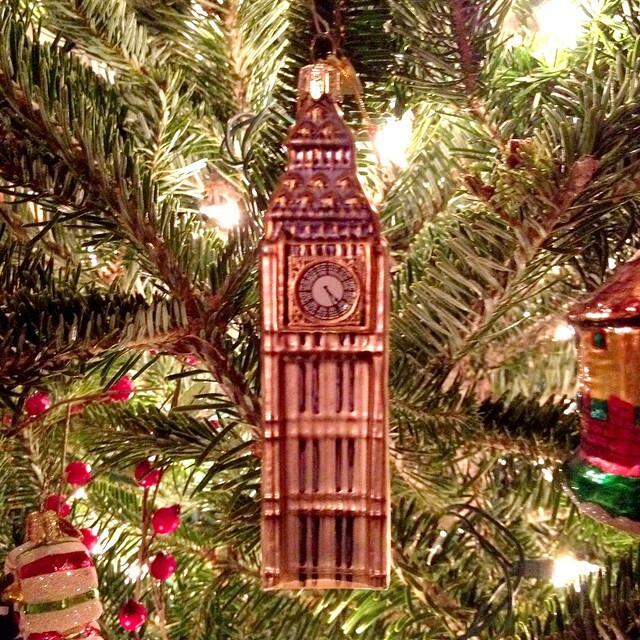 This tradition has been ongoing for 12 years now and has been an extremely enjoyable journey to build the collection of fragile yet interesting ornaments. We now have four large containers of varying size, shape, and variety of ornaments. 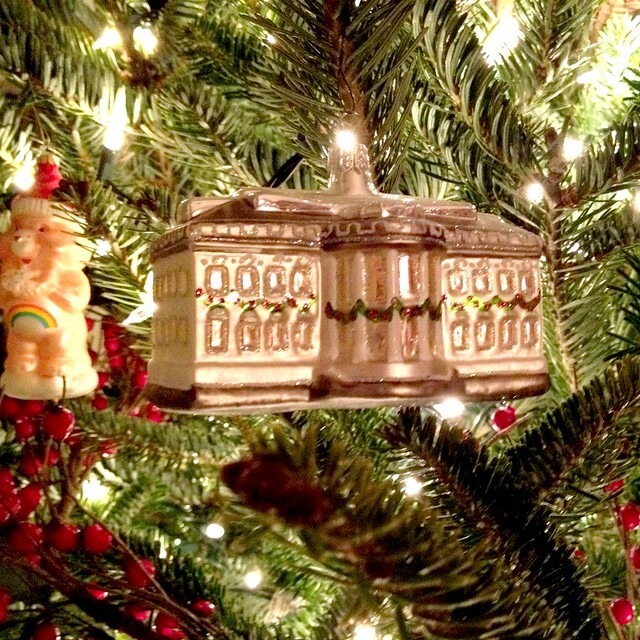 Each ornament has a story or significance to go along with it, and each is special to us in some way. We make a point to search for and purchase new ornaments on vacations or when we find one in some of our favorite places. 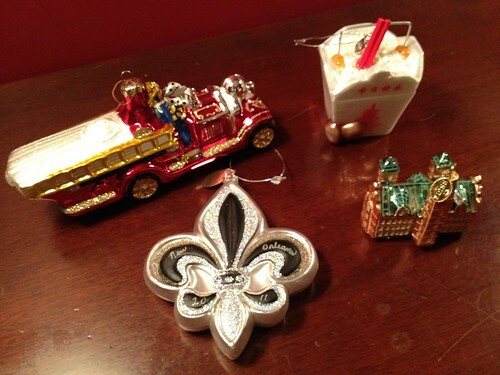 Here are the ornaments that we collected over the course of this year. The fleur-des-lis is from our New Orleans trip back in January, the Chinese take-out container is from San Francisco, the small castle is from Copenhagen and represents the royal castle that we visited, and the firetruck is from Old Town's historic Friendship Firehouse during their annual festival. 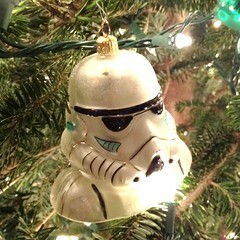 Here are a few more of our favorite ornaments that we have on our tree each year. As you can see, our collection of these ornaments over the years is a fun but fragile process. We've had to be very careful each year, but the tree has survived all of our and our pets' clumsiness. 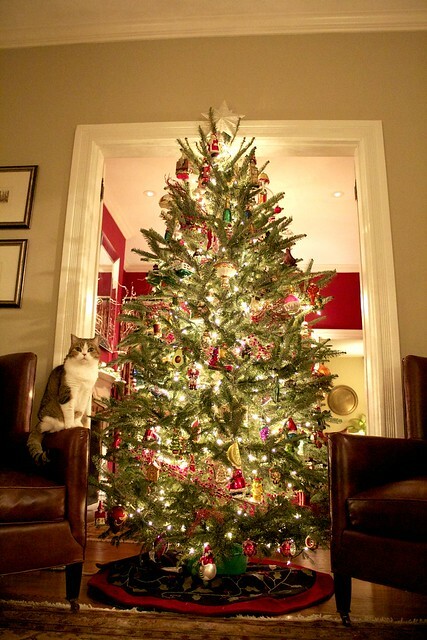 The end result is a fun tree that can be enjoyed from almost every room of the house on the first floor. 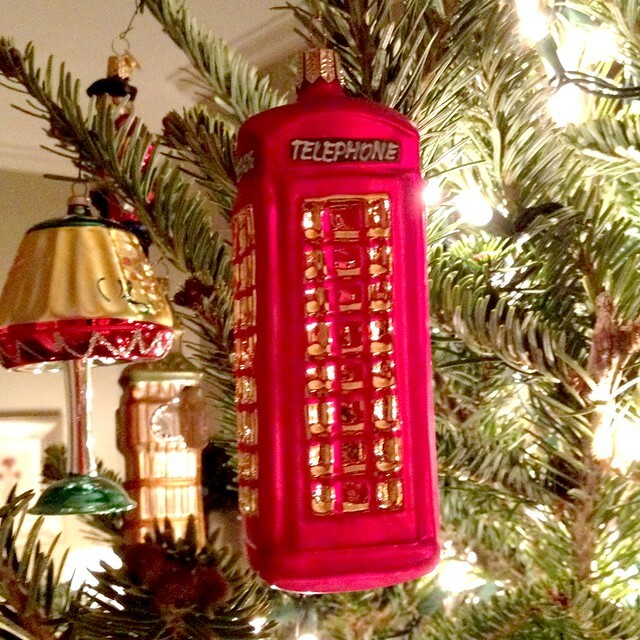 We love Christmas and all of the traditions that come along with it. Both old traditions passed down from our family, and new traditions formed on our own help to make the season enjoyable and special. What sort of traditions do you look forward to every year? Is it your tree, your food, maybe presents, or just spending time with family? Let us know your favorites. Want to see what else we're up to this holiday season? 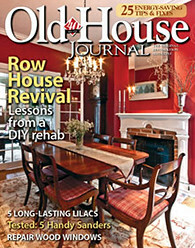 Check out our steps to quick and easy mantel decor, our 2011 list for Santa, holiday hostess gifts made easy, and the details of our first annual DIY gingerbread challenge. 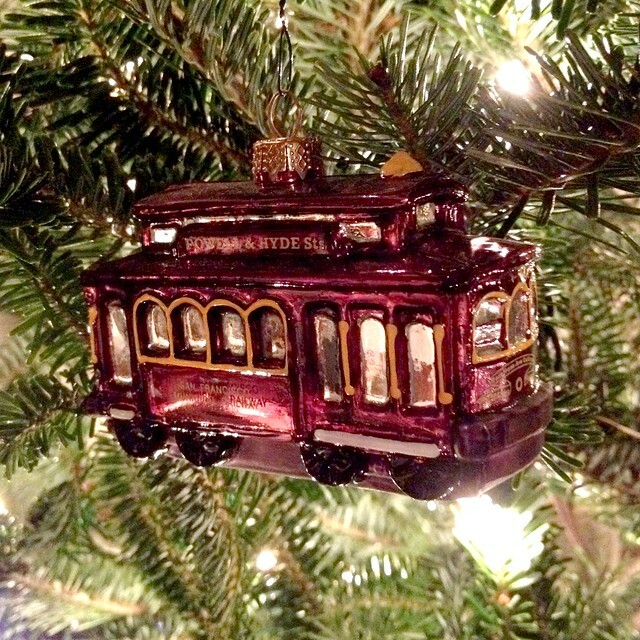 I'm trying to get my husband on the all glass ornament bandwagon but he's less interested in the idea of buying a new ornament on each of our vacations so it's slow going on that front. Maybe I'll show him how beautiful your tree is and that will convince him. You guys rock. 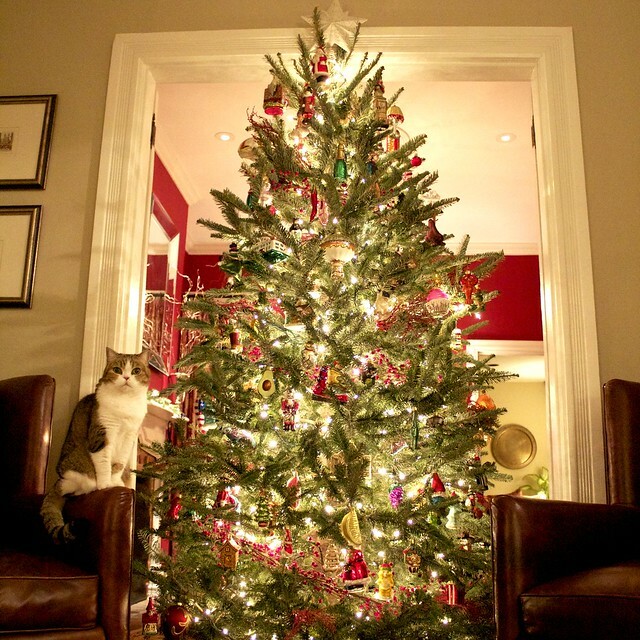 That tree is fantastic and I ADORE glass ornaments. 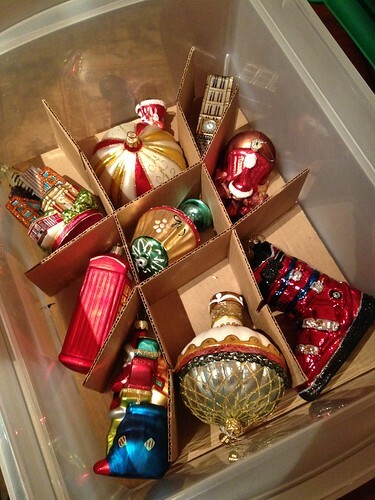 I tend to go to a lot of yard sales, and I often pick up old boxes of glass ornaments. None of mine are in fancy shapes, except for maybe a handful (I have some nice, but new, pine cone ones), but I LOVE the old colours like the blues and greens. I even like the ones that are a bit scratched or flaky. 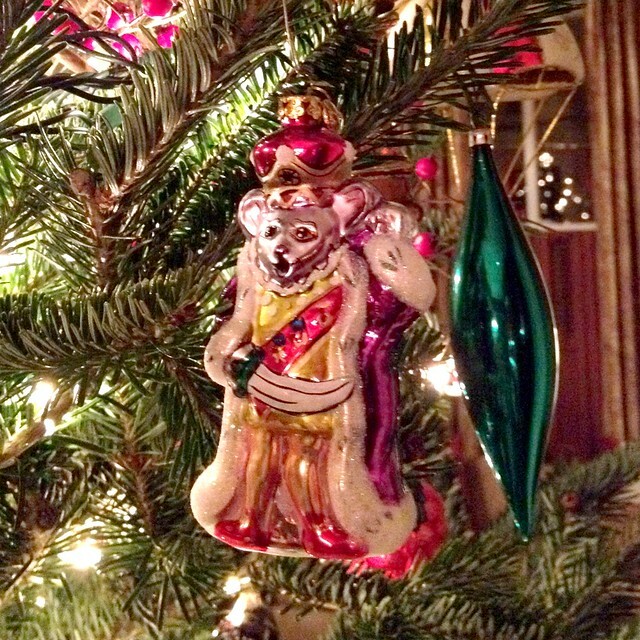 I don't usually limit ornaments to glass, though, since I have a ton of really nice ones that my mom made by hand over the years (some out of felt, some plastic canvas, some needlepoint, etc). I also have old childhood "arts & crafts" type ones. I have two trees, usually - sometimes more. The one in the bay window is 'formal' - color coordinated and often themed. 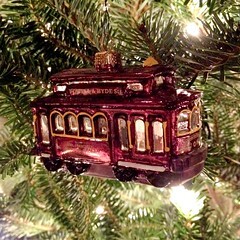 For the last few years, it has been red and gold and Marine Corps ornaments. Now that my son is off of active duty, I need to choose a new theme. The one in the bedroom is a table top size (both are artificial) and has mostly the 'family/crafty/rustic' type ornaments on it. 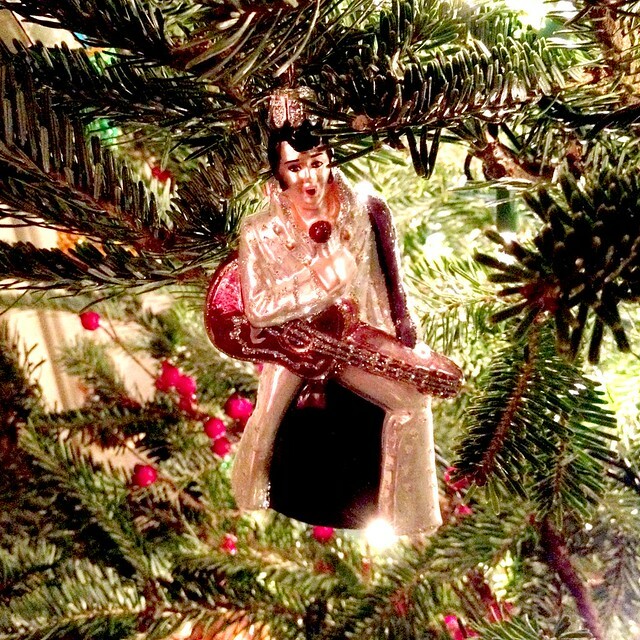 I love your glass ornaments. I like the idea of getting ornaments when you travel. Okay I so very rarely give you guys any ideas. But since you wanna recreate home sweet home-hi-o, there is a super sweet christmas tree farm called Moose Apple Christmas Tree Farm off of Rt 7. A sweet $50 gets you the most beautiful fresh cut tree, plus you can have a picnic lunch on the premises. They have like 45K trees (I really suggest the concolor... it's a beautiful grey blue foliage, very flexible, and lasts forever) and you can swing past the vineyards on your way out. Sunset Hill is right on the way, and its fabulous. Thanks for the tip -- sounds lovely! We'll have to give it a go next year.